Description: Sending automatic tweets to Facebook profile status updates. Send tweets to Facebook fan pages. 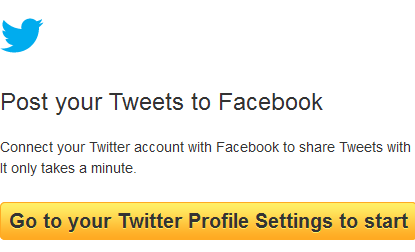 Do you want to send your Twitter tweets to Facebook account automatically? Here is a simple guide that will let your tweet to be posted as a Facebook fan page or status update. Twitter and Facebook both are the most popular platform on the internet. If you are a webmaster, then you must have to keep an account in Twitter and Facebook. If you are a businessman, and you want to share your thought with your partners, workers or friends, those social media sites can help you. We know, specially the webmasters and business owners have the busy schedule on daily basis. Therefore, if we update the same status on both social networking sites manually, it would be more time consuming. By applying this method, you may update your status update by tweeting on Twitter. Therefore, here is a quick guide to post automatic tweets on Facebook by Twitter. 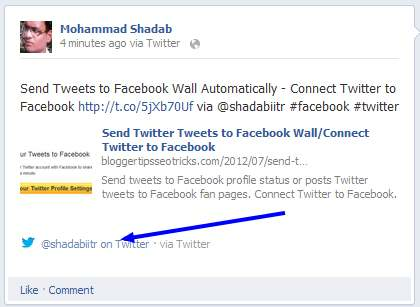 Send your Twitter tweets to Facebook profile & pages wall status. Sign into Twitter, and click here on profile setting menu. Now, click on Connect to Facebook under Facebook option. A window will pop up. Login to Facebook, click on "Okay". Now, select who can see the updates making by Twitter, select it, and again click on "Okay". Now, tick on my Facebook page and select the desired page that will take the automatic changes. The above preview is old so the save changes button is appear. I regularly update our content when found something new. Now, your Twitter account has been successfully linked with your Facebook page so make a tweet to Twitter it will display on your Facebook page too. 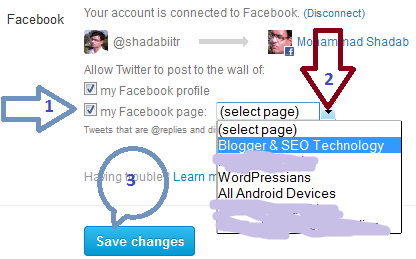 :) You may follow me on Twitter @shadabiitr, and Facebook @BloggerTipsSEOTricks. Conclusion: I really like the Twitter integration on Facebook by which we don't have to update the same news on both networks. I hope, automatic tweets to Facebook fan page or Facebook status update would be beneficial for you too. In reverse, you can also use Facebook integration for Twitter to auto tweets when you update your Facebook status updates.